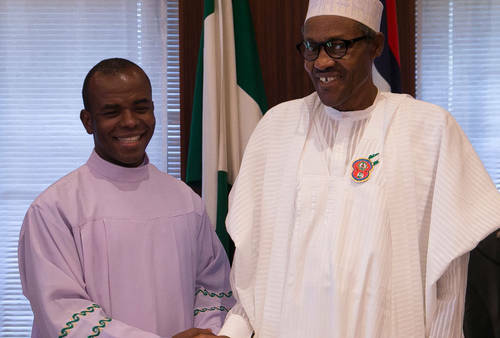 Popular Catholic priest and Spiritual leader of the Adoration Ministries, Enugu, Father Ejike Mbaka has reacted after President Muhammadu Buhari donated N2 million to his church. This is coming about 4 years after he predicted Buhari's victory. He thanked the president for the donation, which was made through Imo APC Guber Candidate, Hope Uzodinma. He shockingly proceeded to flay Buhari for abandoning him and his ministry after the prayers and support they offered him in the 2015 Elections. He disclosed that he slammed ex-Anambra state governor and current Vice Presidential candidate of the PDP, Peter Obi because of his support for President Buhari. Father Mbaka lamented that the President did not carry out any project for his church after the 2015 Elections as a means of gratitude for their support.